Why Does Taylor Swift Have Two Private Jets? Not surprisingly, there’s a strong connection between famous musicians and private jets. From Carly Simon caroling about a mystery man flying his “Learjet up to Nova Scotia” to Elvis Presley’s well-known affinity for aircraft, singers seem to love airplanes (we certainly can’t blame them!) But pop princess Taylor Swift, who has a pair of Dassault Falcon jets, may be one of the current rulers of the charts and the skies. 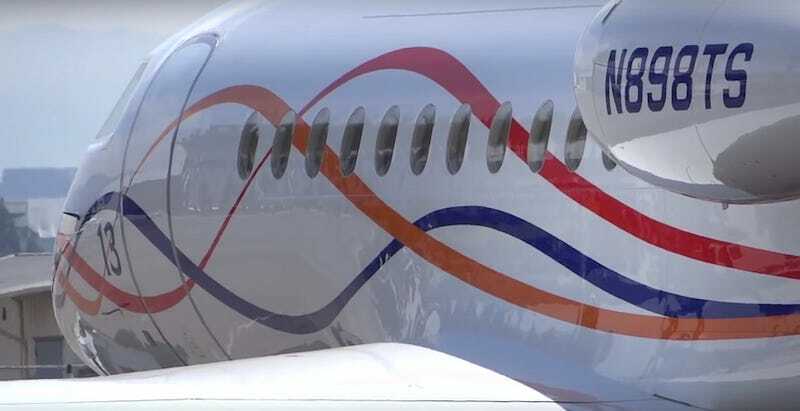 Much has been written about Taylor Swift’s Dassault Falcon 900 tri-jet, which wore a custom livery featuring the singer’s favorite number (13) painted near the main cabin door and an interesting ribbon-like paint scheme that sort of resembles a tribal tattoo from far away. The jet’s registration, N898TS, is thought to be a reference to the year of her birth (1989, which is also the name of her latest album), the number of #1 singles she had at the time she purchased the jet (8) and her initials (TS). The aircraft has since been repainted in a far more subdued and neutral grey scheme. Swift’s Falcon 900 is registered to a company called “S A T A, LLC” in Nashville, Tennessee, which shares a physical address with 13 Management, her management company. S A T A are thought to represent the initials of Swift and her immediate family members, Scott (father), Andrea (mother) and Austin (brother). But there’s another jet registered to S A T A, LLC, a Dassault Falcon 50 that was apparently added to Swift’s squadron in 2012. A Dassault Falcon 50 like the the one registered to S A T A, LLC. Why would Swift need two jets if she can only fly on one of them at a time? There are several possible explanations. First, having two jets ensures that if one is undergoing maintenance, another is likely to be available at a moment’s notice. Additionally, Swift could send one of the two jets to retrieve family or friends while she uses the other one. Swift is also her own company and brand, and with a small army of people supporting her, having a second jet on call adds great capability to her empire. When money is of little to no concern, aircraft are assets that buy the owner freedom, convenience and access that they wouldn’t be able to obtain otherwise. While Swift’s two jets may appear quite similar, there are a few key differences. Both aircraft are made by the same French company, Dassault Aviation, which is also well known for building the Rafale fighter jet. The Falcon 50 was registered most recently to S A T A, LLC, so we’ll start there. Visually, you can distinuish a Falcon 50 from a Falcon 900 by looking at the length of the fuselage (the Falcon 900’s fuselage is five feet longer than the Falcon 50). Swift’s Falcon 50 has a manufacture date of 1998, and is one of 352 Falcon 50’s produced between 1976 until 2008. The Falcon 50 is powered by a trio of Honeywell TFE731 engines, each making a maximum of 3,500 pounds of thrust. These propel the Falcon 50 to a cruising speed of 520 miles per hour and gives jet a range of 3,450 miles. Falcon 50’s are well known for having excellent short field performance, and can seat up to 9 passengers. We don’t know how much S A T A, LLC paid for their Falcon 50 in 2012, but similar aircraft are currently listed on the market between $1 million and $6 million, depending on how many hours they’ve accumulated and individual aircraft history. But many reports indicate that Swift paid $40 million for her Falcon 900 in 2011. Swift’s Falcon 900 originally entered service in 1991, so it is barely younger than the singer herself and substantially older than her Falcon 50. But despite not being the newest private jet in the sky, Swift’s Falcon 900 offers longer legs (nearly 4,600 miles) and greater cruising speed (590 miles per hour) as well as the ability to haul more people (12) than the Falcon 50. This makes the Falcon 900 the ideal choice for intercontinental flights between Swift’s New York penthouse and the London residence of her current boyfriend, Calvin Harris. Is there a reason why Swift prefers Dassault Falcon jets over another manufacturer, such as Gulfstream or Bombardier? It may just be Swift’s personal taste, or it may also have to do with the perceived safety of having a third engine. This could be of particular concern to anyone who intended to make regular trips across the ocean. With an estimated net worth above $200 million, owning and operating a pair of private aircraft is most assuredly not living beyond Swift’s means. Swift’s father, Scott, worked as a Merrill Lynch financial advisor for 30 years, and the Swift family has long been associated with society’s upper crust. Moreover, the singer is only 25 years old, meaning she has many earning years ahead of her. Unlike many other musicians who lease their aircraft, Swift’s ownership of these vehicles shows the degree to which her wealth is managed. Notably, she also owns and operates her own tour coaches and ground logistics vehicles, which she leases out to other production companies when they aren’t supporting her own tours. So, whether or not you’ve warmed up to her music, Taylor Swift clearly has good taste when it comes to aircraft. Whether in the business jet category, or larger airliners like the Boeing 727 or McDonnell Douglas DC-10, there is something about a tri-jet that never goes out of style.